Watercolor on archival paper, 18" x 14.5"
$850, unframe. Free shipping in U.S.Email me if you'd like to purchase. I'll send you a PayPal invoice or we can arrange other terms. We're back to rocks and water again! This is a larger painting, not a daily. A couple of years ago I painted a mural in Sussex, New Brunswick, Canada. It is beautiful--miles and miles of wild, remote country. In places, the forest is so dense it is hard to imagine a rabbit crawling through, let alone a person. The spectacular Bay of Fundy quickly became a favorite. This day of mists felt primal. I half-expected to see the square sails of some early explorer's ship rounding the point. Don, I'm going to write this comment and jump in the car and head to Bay of Fundy! And a watercolor!? Fantastic painting; great textures, lighting, and mood. Wow Cooper, that's great! I envy your ability to just drive right up there--it's a long way from where I am in Oregon. If you get far enough up the Bay, be sure to visit Fundy National Park. Let me know how the trip went, will you? Thanks for your comments. Amazing Don. The water and the distant trees are beautifully painted and I love how the rock seems to be lumbering into the water! Hi Laura--thanks for your nice comments. 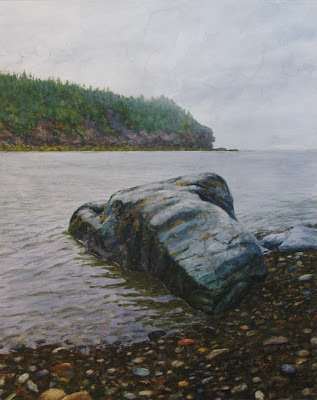 Hi there, Don - I just happened upon your blog and the lovely image of Fundy. Interesting that I just completed a five image photo series of similar coastal views on my Bay of Fundy blog. So much coast here with so many ways to be inspired!! Thanks so much for weighing in. I'm delighted to see your fascinating blog (though you're not helping my time-management, as I must have spent 40 minutes on your site.) Anyway, I've bookmarked so I can come back at leisure. You live in a beautiful part of the world. Been there...but haven't done that! Beautifully painted, once again. Funny how you can identify that part of the world by the shape of the distant bluff - only in Maine/Nova Scotia. Hi Nick, thanks for coming by. That's true, isn't it? Different landscapes have characteristics that make them readily identifiable. Much like recognizing someone's face.